Book a ticket, apply for a visa, prepare workshops, a quick contact with two other experts, pack a suitcase and on to Schiphol Amsterdam Airport. To land, 12 hours later, in a different world. Literally and figuratively. The Indian colors, scents, flavors and hectic, I just love it all. Working for Women on Wings in India also means meeting entrepreneurs and remarkable women. For instance 50-year old Dhanada Katha whom I met when, together with Ronald van het Hof, I was giving a workshop marketing and branding at Tamul Plates in Barpeta in the state of Assam. When, at the age of 18, Dhanada was married off, she assumed that her husband would take care of her. Unfortunately, he died at a young age and she was left behind with two daughters, the youngest only two years old. 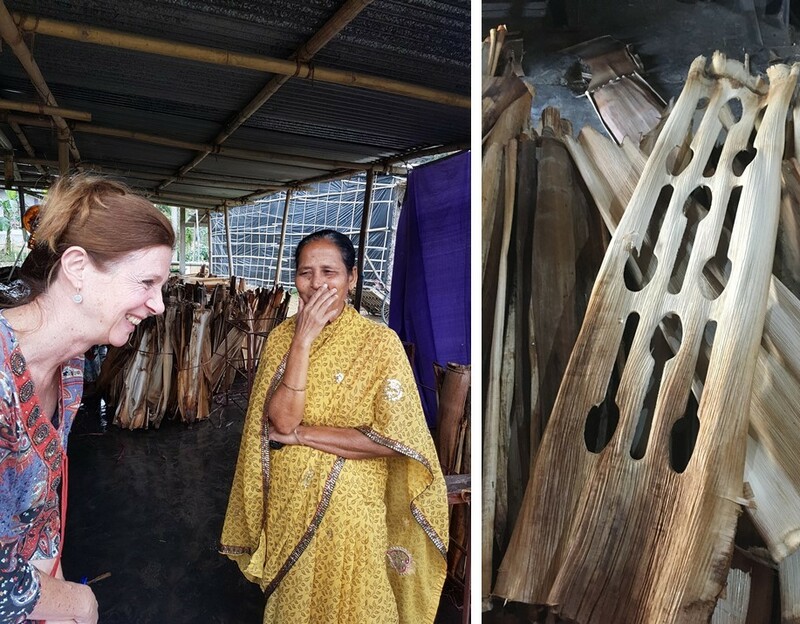 Dhanada had the strength to start working at Tamul Plates, an enterprise that produces bio and eco-friendly disposable dinnerware made from arecanut sheaths. Her work gives her self-confidence, made it possible that her daughters went to school, enabled her to have her own house built and gave her control of her own life and finances. For 15 years now, every day at 5.30 A.M. she is at work, washing and drying leaves. Her story makes me think and lets me view my own life and work from a different perspective. What if I had been in her shoes? Would my willpower have been strong enough to do the same things? Her story stresses the importance of creating jobs for women in rural India. Fortunately, there are entrepreneurs like Arindam Dasgupta. With a drive to increase the sales of the products made in his company. B-to-B, B-to-C, export. His enthusiasm is contagious. Disposable dinnerware will get the better of plastic. For two days we work together, ask questions, learn to focus and make choices, and share our knowledge. He also takes us on a tour of the production unit where the leaves – natural waste matter from the trees – are compressed into plates and dishes of all kinds of shapes and sizes. My eye is caught by a beautiful leaf from which spoons are punched. They give me a surprised look when I pick it from the rubbish bin. For me, however, in many ways it is a piece of art. It has survived the return trip to the Netherlands and now adorns our home kitchen. Each morning when I walk past it, I think of Dhanada and the work I can do for Women on Wings. Lucky me.